Need another giveaway? How about a chance to win some Country Bob's Sauce? We LOVE Country Bob's and just found out a few years ago that it is made less than one hour from where we live. So yes, we are huge fans of the sauces and spices. Enter below for your chance to win your very own Country Bob's Sauce kit! Good Luck! Let's take a trip back in history and let you know how much pride is taken in each and every bottle of sauce they produce. Where do great products come from? Usually they are the result of much time being exerted and a tremendous amount of love being invested. At that point you can say, “That’s mine! I made that.” That’s the way Country Bob Edson created his All Purpose Sauce. It was actually October of 1982 when Country Bob, Inc. became the company, which remains today. Bob Edson, Terry Edson, Al Malekovic and Reed Malekovic formed a corporation with equal ownership. Since that time Country Bob’s distribution has magnified regionally in all directions from our corporate office located in Centralia, Illinois. Even with the tremendous growth we have not forgotten where we came from, continuing in our relentless pursuit of product excellence. Along with our All Purpose Sauce we have expanded our product line to include BBQ Sauce and Seasoning Salt as well as Apple Chipotle and Honey Habanero All Purpose Sauce and the newest member to the family Country Bob’s Marinade. With our fully automated bottling line we also have the capability of producing Private Label products for stores or restaurants. Country Bob’s All Purpose Sauce is in a class by itself. It is more than a steak sauce, because of its unique flavor and the variety of uses. You can grill, cook, and marinate with it, or put it in your soups, stews, baked beans, and your other favorite dishes.Experience the Taste of our Gluten Free All Purpose Sauce! Steak, Chicken, Barbeque, Fries, Hamburger, Fish and so much more! your beef, pork, poultry, wild game, fish and even vegetables. 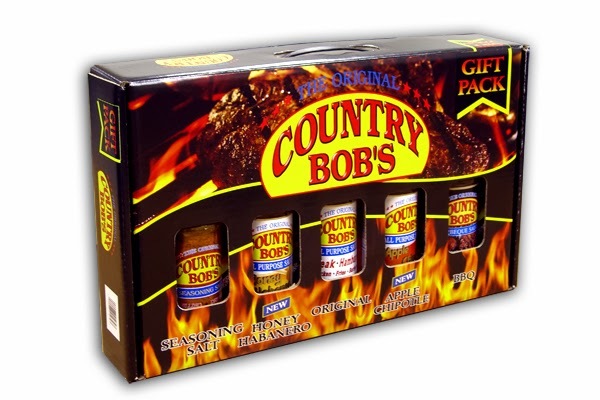 Holiday Contest and Sweeps received samples of various Country Bob's sauces for review purposes in this giveaway. The sponsors will be responsible for the awarding and shipping of the individual prizes. The winners will have 48 hours to reply to the prize notification email, failure to reply in that time frame will result in another winner to be drawn.